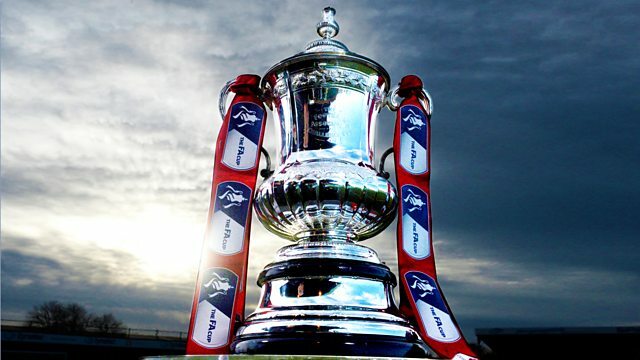 Gary Lineker introduces live coverage of Manchester United v Wigan Athletic in the fourth round of the FA Cup. Browse content similar to Fourth Round: Manchester United v Wigan Athletic. Check below for episodes and series from the same categories and more! It is said that from the smallest beginnings, the greatest legends. the spotlight. 35 years ago, they were in the Northern Premier League! the odds. But since then, a of interesting things have happened? they perform. Very jolly, wasn't he, very uplifting?! Must be the hair! itself at times with his body language, but the ability is there. Gary. Perhaps we could do a half-time analysis on smiling! obviously, a derby. The goal against Newcastle was probably better. what I want to do. To score goal, it's the best feeling. really spectacular to it yourself among those names? Yes, of course. and stay in the game and hopefully I'll get the opportunity to manage. a goal. There isn't, is there? No. You never get them back, I'm afraid! non-league. That is quite something. -- from Sutton. Great scenes, Alan. leads today. Sergio Romero place in goal for the sixth time this season. he has got an Old Trafford future under Mourinho. Wigan are unchanged. Power and Sam Morsy. One goal in the last 16 games for Will Grigg. Wigan have three players that were once an Manchester United's books. beaten by teams of the second-tier since 1982, when Watford beat them. with United in the third round of this competition a year ago. has already given possession away twice. He scuffs his cross somewhat. Wigan goal. And Burn, in front of him at centre-half, six foot seven. Expect him to do well at set pieces. Mkhitaryan just a little short. for his family, I'm sure. Another Wigan Athletic throw in. according to that lot. There is one yolk who is shirtless. Warren. Was on the coaching staff at Manchester United for 18 years. on a free transfer from Fulham last summer. back there by a frustrated Marouane Fellaini. Good play from Morsy. at Barnsley, a little higher up the Championship. have conceded fewer goals. -- only seven teams. Dan Burn will move forward for Wigan now. on target comes from the visitors from the Championship. make. You would not want to give him too many chances, the mood he's in. has had few opportunities under the new regime this season. about Wigan in the midfield, the way they're getting the ball back. Jacob was screaming for that one out wide. Free kick given against Wayne Rooney. exactly crisp. Morsy... It has just run away from him. the number of trophies this fella has won. why the sign him here, to get those crosses in. really. They just haven't started playing yet. A lovely trip to ball through to Rooney by Mkhitaryan. Slowing advances, Schweinsteiger gives him the ball. predictable with their build-up play. the ball. Sam Morsy has been most industrious in the Wigan midfield. touchline. Rooney is having a word with him. Rooney just went down and he barked at referee Niall swore brick. goal. Still 0-0. It come Wigan once more with Sam Morsy. he blocks him. Just shows you, though, the effort from distance. Plenty of confidence coming into Wigan. team in red are getting a bit of tempo back in their play. Rooney feeds it wide to find Mata again. But he can't beat Perkins. Fosu-Mensah. -- Fosu-Mensah barging into the back of him. throw-in. Excellent tackle from the big man. he gets that. Not many have legs that long to execute that challenge. The player at the same time as the ball. Fosu-Mensah has crept forward, wide right. Schweinsteiger. Intelligent play. Hold onto the ball for your team. Give the defence a bit of a breather. driving with the ball in a central position. He whips it crossed. from one foot to the other. Warnock diving in. Rooney territory. is saying he should have this one instead. Let's see. towards Rojo. Headed in for a United corner. -- headed behind. again, Smalling's league. Morsy miskicked it. In those Mkhitaryan. pieces. -- very dangerous at set pieces. you do not do that if you are an ordinary player. deserve to be here. A manager who once coveted him for Chelsea. applied themselves? MARTIN KEOWN: Exceptionally well. Morsy particularly. Getting up to support Grigg. Power and MacDonald. The defence has not really been tested. weekend making lots of changes, and not performing well, of course. isn't he? Fellaini a little bit unlucky on this occasion, maybe? exceptionally well, the young 19-year-old, on loan from Everton. I'm sure Ronald Koeman will be happy with his performance. solve a problem for Wigan. Back it goes to Sergio Romero. wide positions. Pretty strong down the middle, Wigan. Fosu-Mensah going on... Stopped by Warnock. young Callum Connolly. -- too much will. of any real quality. That makes a huge difference to the game overall. they have made it far easier for Wigan then it should have been. get in behind the Wigan back four. Wigan have had a couple of chances. has already touched on Callum Connolly, who has been excellent. action, starting at Gander Green Lane. so tight. It's a really good finish. Nicky Bailey now for Sutton. follow up. Jamie Collins, the captain of National League Sutton. Can he put them in front? It's a lead they would certainly deserve. responsibility and sent the keeper the wrong way with a great penalty. beaten a Premier League team. It's been one of those days so far. the Wigan performance so far. We don't like losing games of football. We frustrated them for 43 minutes but then Fellaini is too powerful. FA Cup football, third and fourth round. We have seen lots of upsets. unfortunate. I don't get and never have done the resting of players. geriatrics! Highlights of all the games at 10:30pm tonight. Chelsea. Still time to sign up for the FA people's cup. Mata got there to hit it. Here is Fosu-Mensah. Good for a cross. picking and choosing when to go, but they have to carry more of a threat. return to Martin Keown and Guy Mowbray. that has taken Manchester United to Wembley at least once this season. him. What macro Wayne Rooney in his old role. That is what would expect. to run behind in that first half. That one running away from Rooney. when you score a goal, doesn't it? Fellaini, who has got the one today. Firmino 's. He is next to the chairman, 25-year-old David shark. rather be in Manchester myself. Sure! to see slightly better technique at the end of it. Let off for Dan Burn. birth of Marcus Rashford, with his two goals in the game. players when he needs his manager to back him first of all. In the two most recent seasons, they have Mr Champions Day qualification. Schweinsteiger goes on...! Blocked by Buxton. and opportunity... Perkins! Now, here's Warnock. Sergio Romero there very nearly put his team in trouble. It is a problem of their own making, from the goalkeeper. gone very high, he fancies another one of those crosses. that's what he's about. Mounting Manchester United pressure. bids from Norwich and Derby, which have been turned down for now. stands still for them, and it finds its way into the back of the net. certainly does try to express himself. them. -- it all broke down for Wigan. Mourinho. Don't give him a chance to take you off. Morsy by Marcos Rojo. Chased eagerly by MacDonald. that Fellaini does now gets a round of applause here at Old Trafford. Christmas, he came on as a substitute and was roundly booed. talk about resting players and using the full breadth of your squad. intricate play, put it in the box for me and I'll get us on our way. straight behind for a goal kick. Rooney lets it run across his body. to take chances, and why wouldn't that lead to many more for United? all. That was clinically done. Running with the ball, top quality. I mean, Martial, why he wants to play down the middle, I don't know. flow there, Manchester United. That's when they are at their best. long to become a Manchester United player of real recognition. Manchester United fans per ring was in pre-season at Wigan, a 2-0 win. Wigan are going to make their third and final available substitution. rescue. It was off his heel. Could have gone anywhere. Tuanzebe a little more solid with that one. Rooney goes into win the ball from Tunnicliffe. Martial is away again. fouls the Wigan winger. Nit-picking, Martial can do that a bit quicker. Manchester United chants going around Old Trafford at the moment. They will be taking their place in the draw for the next round. Tonight, of course, you can see highlights of all of today's action. No shocks here, but there have been elsewhere. found Martial. Martial! Got up above Warnock. here. That was not always the case that Bayern Munich, that's for sure. under there somewhere from the man who turned 54 on Thursday. wonderful talent. It just looks so easy for him. by Morsy. Smalling times his challenge well. Good defending, jockeying his player. Good for his confidence. get a touch on it. Martial! But the whistle has gone! That won't count. Schweinsteiger. Well done, the referee. for more goals here. Advantage played by the referee. Martin, you can tell us who your choice for Man of the Match is? previous clubs in the cups, with three Ukrainian cups in his cabinet. pass, he has pace. And he gets an awful lot of goals as well. coach to the development of the young players at Manchester United. tricky ones at home - Sheffield Wednesday and Norwich. Jose Mourinho. He's Manchester United men have got it done today. won United the game. Second half, they passed the ball really well. Wigan, time to concentrate on survival in the Championship? Yes. was crucial? Yes. Wigan have worked so hard and were very organised. it. And that made it very, very difficult for Wigan to come back. the left-hand side, cutting in, and he is a nightmare to defend against. centre forward. He definitely seemed a lot happier when he came out wide. happier being out there with more space to run into, more freedom. we could finalise with a goal. Chris, you are on the scoresheet. them now. Maybe you should look at them and say, as he managed it well? 45 days. But they have got the squad full internationals have come in. Canterbury lane, the home of Sutton United. -- Gander Green Lane. referee's flag was up. That is so tight. It's a really good finish. the FA Cup, further than they have ever been, eclipsing even 1989. Gander green line goes mad. Sutton United 1, Leeds United 0.
get one hell of a draw, one of the big boys at home. What a story! obviously well, and the second half was much better. We deserved to win. playing quite well, so we are happy with him. And Q.
upfront. They would just worry about the lack of goals in the team. Yeah. but not at Sebastian Vettel is Old Trafford. goal. Ball swung in, and Romero has put it straight out to Perkins.